DUG Insight User ManualFrequently Asked QuestionsFrequently Asked Questions WorkflowsHow to apply complex hand-drawn mutes to gathers and combine 2D results? When working with complex hand-drawn mutes, the number of control points can quickly grow to unmanageable numbers. 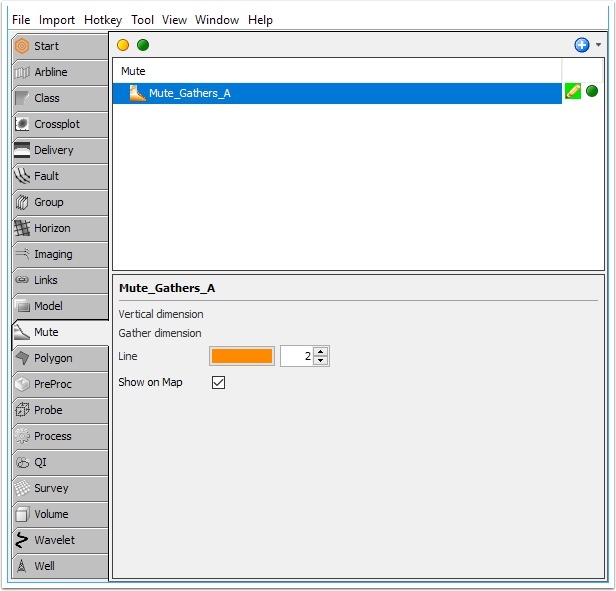 If you have access to the Image Gather Processing module, then consider using a polygon mute instead. This workflow is useful for anyone without access to the polygon mute process. Instead of creating a single polygon mute for the entire line, create multiple hand drawn mutes, applying each mute separately, and combine these muted volumes (using volume maths) so that each mute is only applied over a certain CMP range. Because it works with CMP values, this workflow is limited to a single line at a time. Go to the Mute tab and add a New Hand Drawn Mute (see Manual Picking (Mute)). Pick mutes for first N traces until an unworkable amount of control points appear. Next, go to the Process tab and add a Mute Gathers process (see Mute Gathers). Apply Mute Gathers process and select the previously picked mute to create Muted Volume A. Return to the Mute tab and add another New Hand Drawn Mute. Pick mutes for second N traces until the mute is unworkable. Apply a new Mute Gather process to create Muted Volume B.
Repeat these steps until mute has been picked over the line. 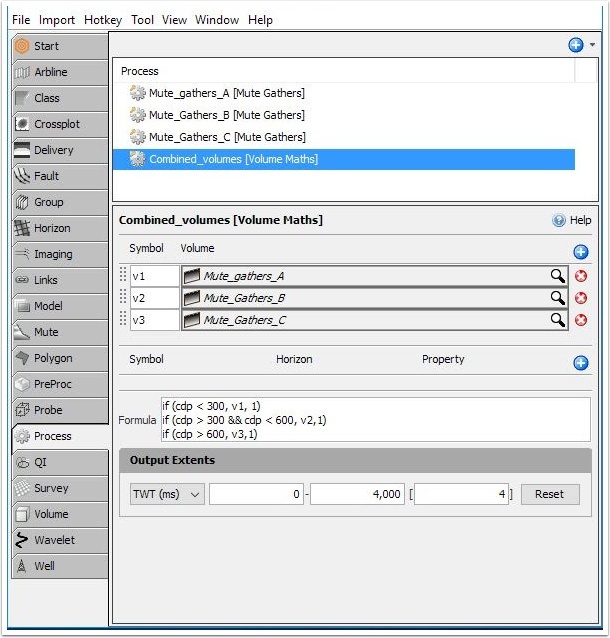 Use Volume Maths process to combine the Muted volumes. Click the blue "+" button and add the mute gathers created earlier. This approach can be adapted for more sections by extending the formula, e.g. for 5 sections. Next: How do I create a 3D Chair?